Make the most of the last of summer’s fresh peaches with these two delicious, healthy recipes. Frozen or canned peaches would work also, but there is nothing like fresh summer peaches. 1) Peel peaches and cut into cubes. 3) On flat clean surface, place one sheet of phyllo. Brush on a bit of canola oil. Place another sheet of phyllo on top and brush with canola oil. Repeat with two more sheets of phyllo. Cut layers into three even strips. 4) Place a couple tbsp. of the peach mixture on one half of each phyllo strip and pull up the strip to cover the mixture. Press down the edges of the phyllo. Place onto greased baking sheet. Sprinkle tops with sugar. 5) Repeat steps 3 and 4 with the remaining phyllo sheets and peach mixture. 6) Bake in preheated 350 degree oven for 20 minutes. 1) Mix together the dry ingredients. 2) Stir in the wet ingredients and then fold in the chopped peach. 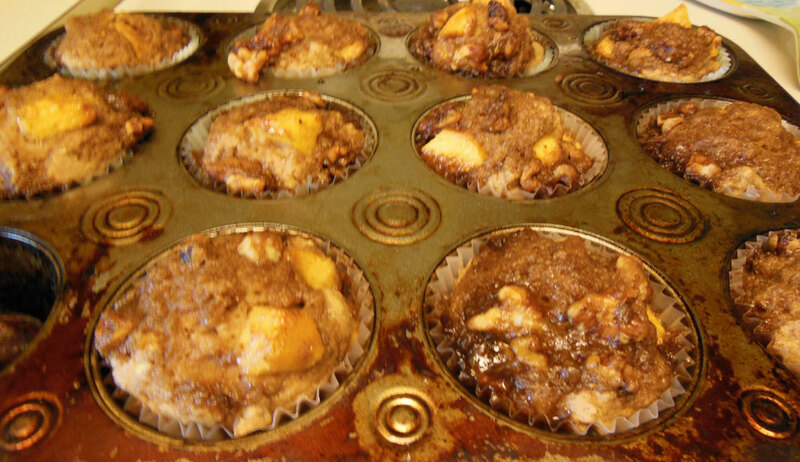 3) Add to muffin cups or greased muffin pan. 4) Mix together topping and place some on top of each muffin. 5) Bake in 375 degree oven for 15 minutes. 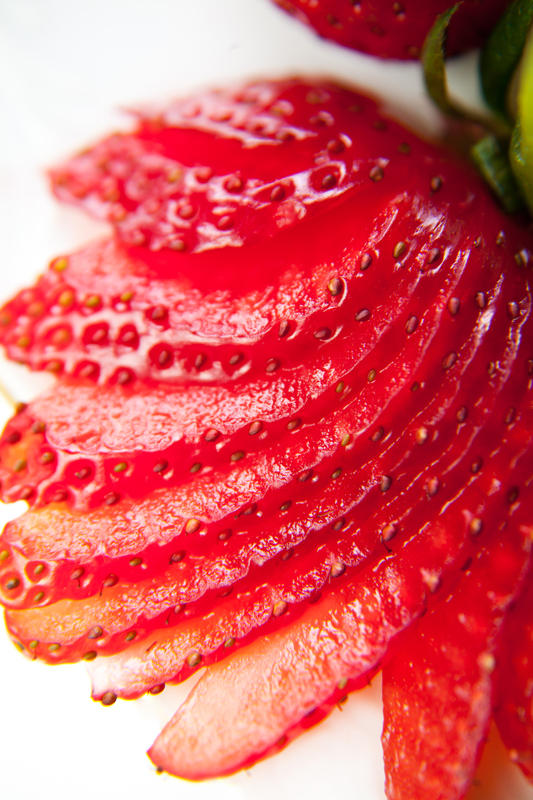 Sure you can find strawberries in the supermarket year round, but nothing tastes like fresh, local strawberries. In the mid-Atlantic, they are available in late spring. Berry farms let you pick them yourself and allow you to eat as many as you like while picking. 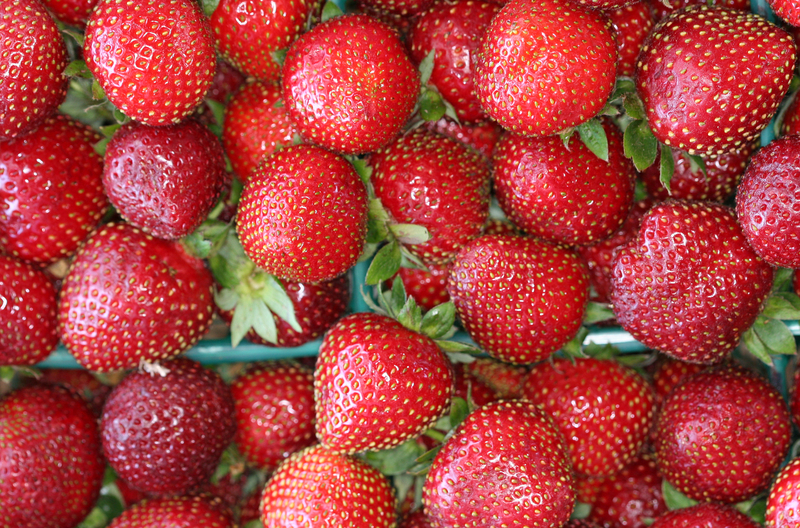 Farmer’s markets have tables of fresh berries and even some of the supermarkets choose to carry local berries over the ones hauled in from far away. Take advantage of the season with one of the recipes below. This recipe works with peaches or other berries as well. Tastes like it was really hard to make, but it’s easy. Make it ahead of time and pop in the oven just before dinner. The whole house will smell delicious. 1) Mix berries and sugar in medium bowl. 2) Add flour, baking powder and milk to medium-size mixing bowl. Blend in melted smart balance or butter substitute. Spread into medium-sized baking pan. Add blackberry/sugar mixture on top of batter. 4) Delicious with soy or coconut ice cream. These mini fruit pies are relatively easy to make, will make your house smell wonderful and will delight your lucky guests. 1) Mix fruit, ¼ cup sugar, flour and spices in a medium-sized bowl. Let rest for at about 15 minutes. 2) Unroll pie shell and spread out. Divide into four even pieces. 3) Grease a cookie sheet. Place each pastry piece on the cookie sheet. Fill with about ¼ cup of the fruit mixture. Roll up the edges of the pie shell to form a little package. Sprinkle with sugar. 4) Bake in 425 degree oven for 20 minutes. Will be golden brown on the outside. Delicious! 2) Purchase toasted almonds or toast them in preheated 400 degree oven for about 7 minutes. Watch carefully so they don’t burn. If you have kids around, give them the ingredients and let them make their own. 1) Put all ingredients into a blender and pulse until well blended. 2) Pour into 2 glasses and add straws. It seems like there is always a banana in the fruit bowl that is just a little too ripe to eat. A banana like this is perfect for banana pancakes! Slice it into the batter. It adds a little sweetness and also potassium, fiber and vitamins. 3) Cook a few minutes, then flip and cook the other side. Should be browned on both sides. 4) Serve with maple syrup or honey. 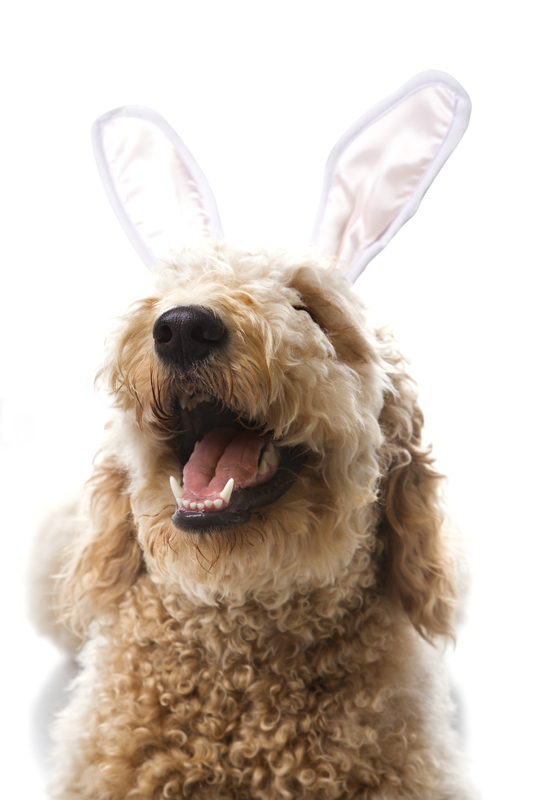 Easter comes at a different time each year, and this year it’s early in the calendar. But it’s not too late to plan a lovely brunch. All the recipes below are healthful and vegan. 1) Mix oats and almond milk together in bowl until blended. Place in refrigerator overnight. 2) The morning of your breakfast, add all ingredients together with oat mixture and blend. You may need to add a splash or two of almond milk if it is a little thick. 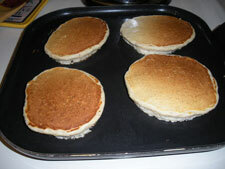 3) Grease a flat skillet and make the pancakes just like you make regular pancakes. If you like silver dollar, make those. If you like one great big pancake, have at it. Generally I used about ½ cup of batter per pancake. 4) Flip pancake and cook other side. Both sides should be golden brown. 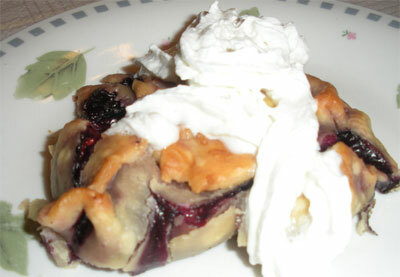 Serve with maple syrup or berry sauce. This sauce is packed full of antioxidants and contains very little sugar. It’s good for you and tastes great! 1) Wash berries and mix together with sugar in a medium-sized bowl. Let set about 10-15 minutes so berries macerate. 2) Place berry mix in a medium-sized kettle. Add honey and spices and 1/2 cup of water and bring to a low boil. 3) Boil for about 10 minutes, stirring occasionally. 4) Then reduce heat and simmer about 20 minutes. 5) Berries will burst and you will have a delicious sauce. There is probably a banana or two on your counter right now that is too ripe to eat, but not rotten enough to throw away. 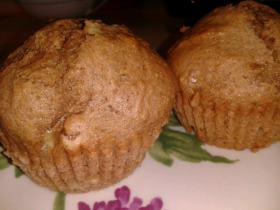 These bananas are perfect for making banana nut muffins! Make a batch for quick and healthy on-the-go snacks and breakfasts. 1) Mix all wet ingredients together (except banana). Whisk in sugars. 2) Mix all remaining dry ingredients together, except nuts. 3) Gradually add wet ingredients to dry ingredients. 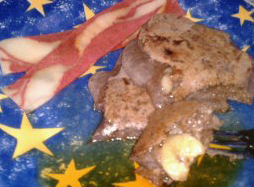 4) Break ripe banana in small pieces into batter. Add in nuts. Mix everything together. 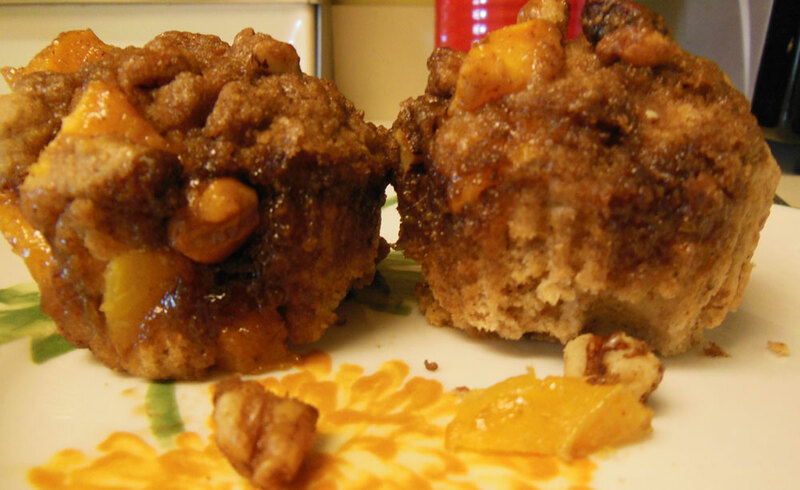 5) Spoon batter into muffin cups. 6) Bake at 350 degrees for about 20 minutes. Even if you eat eggs and do not have to watch your cholesterol, you will LOVE this recipe. Better than real scrambled eggs. Seriously. I only tried tofu scramble once before – at a vegetarian restaurant in Washington, D.C.–and this version is way better (even though that one was good). That said, feel free to change this up however you like. For instance, if you can’t stand mushrooms, leave them out, or substitute a vegetable you do like. 1) Drain tofu of all water and pat dry with a paper towel. You may go through several paper towels while removing moisture from the tofu. 2) Heat about 1-2 tbsp. of olive oil over medium heat in a frying pan or wok. Add the diced onion and sauté a couple of minutes. 3) Heat about 1 tbsp. of olive oil over medium heat in a second frying pan or wok. Simply crumble the tofu into the pan. Stir every minute or two. 4) Meanwhile, add the diced red pepper to the pan with the onions. Saute together a few minutes. Then add the mushrooms. 5) In the tofu pan, add the turmeric, cayenne pepper, garlic powder, salt & pepper and stir together. 6) Add the spinach to the pan with the onion mixture and stir together. Cook another minute or two or until spinach wilts. 7) Add the vegetable mixture into the tofu scramble mixture and stir everything together. 8) Add the daiya cheese and stir together. 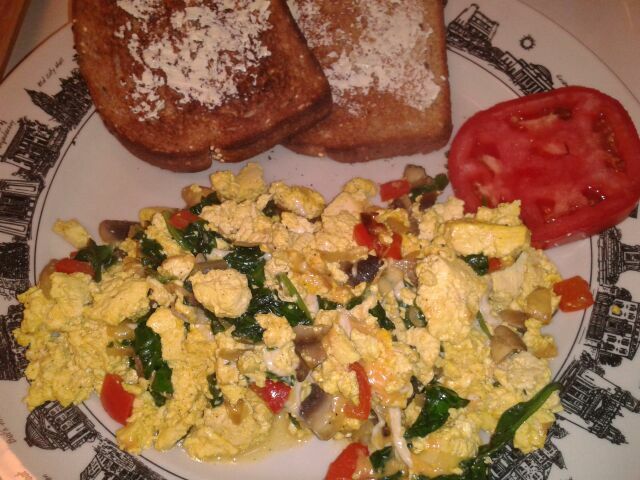 9) Plate with toast and your favorite hot sauce on the side (I used Louisiana brand.) Delicious! As a housewife in the 1960s and 1970s, my mom embraced Bisquick and all of the other modern shortcuts to a good suburban meal. 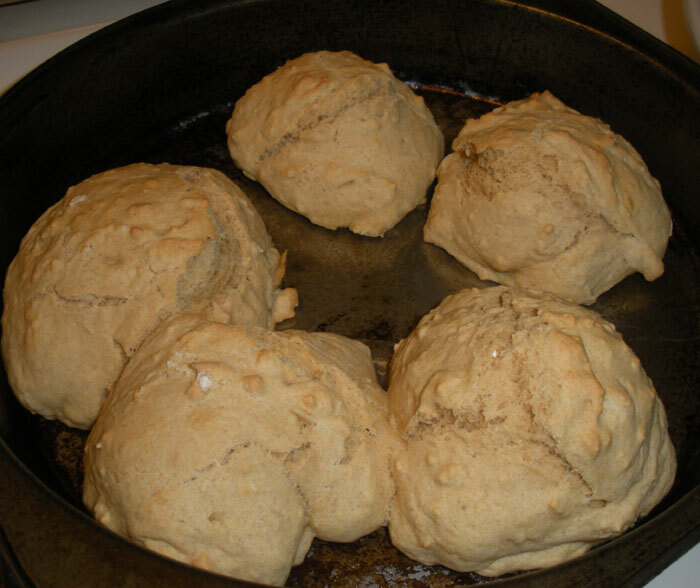 So, until today, it did not occur to me to try to make biscuits from scratch. I figured they would be too time-consuming, difficult or fattening. 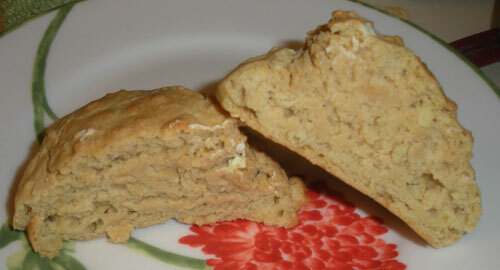 Inspired by a delicious-looking blog entry at the Amateur Gourmet , I decided to try to make some biscuits. Lazy Biscuits Turned out Good! 1) Mix together dry ingredients. 2) Melt Smart Balance in the microwave and add to the dry ingredients. 3) Gradually stir in the unsweetened almond milk. (You may need to add another tbsp. of flour if it looks too wet). 4) Spray a cake pan with non-stick cooking spray. Drop the biscuits by big spoonfuls into the pan. 5) Bake at 500 degrees for 5 minutes. Reduce heat to 450 degrees and bake another 10-15 minutes (check after 10 minutes). 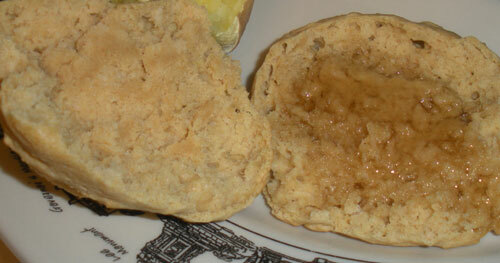 6) Try with apple butter or honey. Yum! Vegetarian Light has a Cookbook!